Mark Pegg, left, fisheries ecologist with the School of Natural Resources, accepts the Nebraska Chapter of the American Fisheries Society Award of Excellence. 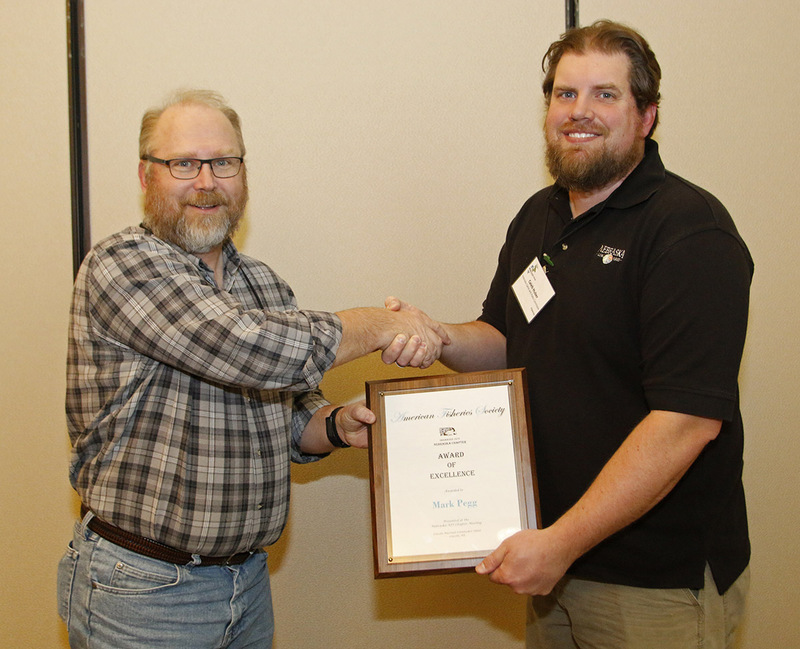 Mark Pegg, fisheries ecologist with the School of Natural Resources, was awarded on Tuesday the Nebraska Chapter of the American Fisheries Society Award of Excellence. The award is the society’s highest for scientific achievement and is presented to a society member who makes outstanding contributions to the science of fisheries and aquatic resources. It was awarded at the annual meeting held in conjunction with the 77th Midwest Fisheries and Wildlife Conference on Feb. 5 to 8 at the Cornhusker Marriott Hotel in Lincoln. “Mark has developed the fishery program at the University of Nebraska-Lincoln from a program of regional stature to one of national prominence, and he has done so in a single decade,” wrote Kevin Pope, assistant unit leader of the Nebraska Cooperative Fish and Wildlife Unit at SNR, in his nomination letter. The program has grown from 93 students in 2005 to 193 in 2015, and Pegg has graduated 18 master’s students and four doctoral students in that time. He also has had more than 90 papers published in peer-reviewed journals, including one in Science, as well as five chapters in books.